True fitness doesn’t just come from the gym; it’s found in our purpose, intentions and the desires of our heart. Discover the women who’ve walked this truth from the beginning. Have you found yourself wondering how you got here? Sometimes, as women, we tend to focus on the negative side of things. Be it critical comments from others or our own pessimistic thoughts, it can be easy to latch onto the negative, while self-confidence and personal motivation drain out of you. Here at Wellworks For You we want to change that around. We have compiled this list of 5 Iconic Women who have created a hub for women’s fitness motivation to be passed down into our lives. Take a look at these women who made it possible for women everywhere to finally work towards being comfortable in their own skin and to strive for something greater. In 1963, this woman founded Weight Watchers from a weight loss group she started out of her living room in Queens, New York. After being obese her entire life, she went from 214 lbs to 142 lbs all on her own. By building a community of support, Jean was able to reach her weight loss goals. She then built her company based on that life-changing principle. Now, Weight Watchers helps not only women, but men as well, to reach their health and fitness goals. Yes! Oprah has shown the audience what it is to lose weight and maintain that weight loss. Not only is she open regarding the struggles women have during weight loss, she has also been open regarding gaining that weight back. She isn’t shy to criticism, and she boldly speaks out for those women who can’t find it in themselves to do so. We bet you were waiting for this iconic woman! When it comes to women’s fitness motivation, she is the poster-woman. Jane Fonda brought us the fitness craze of the ‘80s and ‘90s. Her leotards and fitness videos grasped the audience and encouraged women to reach the physical fitness goals that they so desired. In 1982, Jane Fonda released her first tape which became the highest-selling video of all time. As a motivational speaker, this young lady speaks all over the world and is recognized for her encouragement in “self-help”; a term that is frequently frowned upon. Gabrielle teaches on forgiveness, self-love and a holistic approach to spirituality – helping women reach their inner-happiness and encouraging them to live out the futures they have always wanted to have. Perhaps one of the most inspiring women, Kris was diagnosed with stage 4 cancer back in 2003. Instead of allowing the thoughts of cancer to cripple her life, she began an adventure of total wellness. Over a decade later, she is still living a happy and full life. She encourages women to take back their health by eating well, exercising, and reducing stress. 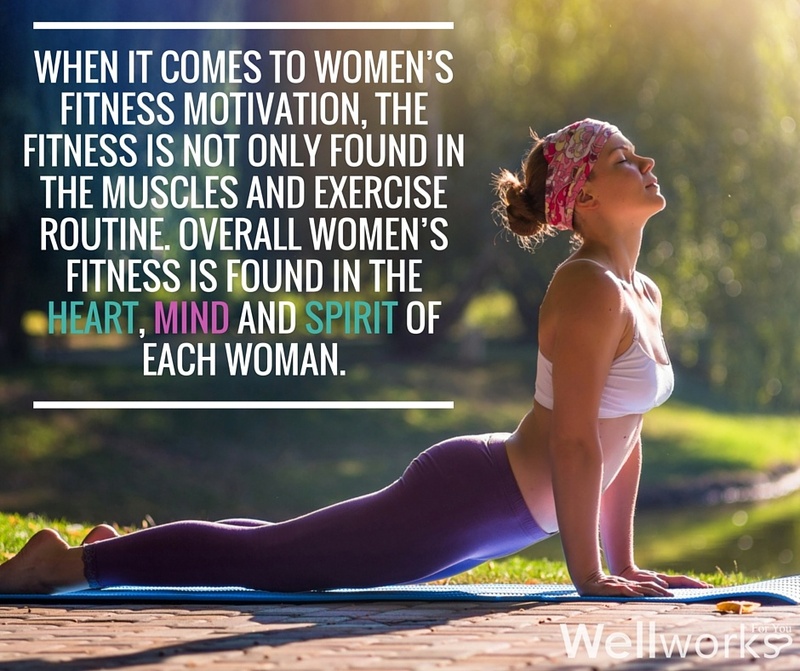 When it comes to women’s fitness motivation, the fitness is not only found in the muscles and exercise routine. Overall women’s fitness is found in the heart, mind, and spirit of each woman. Here at Wellworks For You, we encourage healthy living for both women and men. To help you achieve your fitness goals, we provide you with a personal Health Coach who will take you step-by-step into the healthy life that you long to live. For more information on how Wellworks For You can transform your life, give us a call at 800-425-4657.